Without supply lines, you'll need to personally carry all the junk required to construct everything a settlement needs. Every settlement starts with a handful of settlers and not much else. If you want to pool resources and really revitalize the wasteland, you're going to need plenty of supply lines. It isn't even that hard! For even more settlement info, check out the Fallout 4 Survival Guide for loads of additional tips and tricks. If you're new to Fallout 4's settlements system, you might be wondering what exactly supply lines do and what they're good for. Establishing a supply line between two settlements instantly allows you to access any items stored in the workshop inventory from both locations. This doesn't apply to all things -- strangely enough, the resources for crafting are pooled, but the actual items cannot be found in the inventory selection. We'll go into more detail on that later. Chaining supply lines together, visible on your PipBoy map, will extend the network, pooling together any items from the combined workshop inventories. That includes resources and scrap collected by settlers. Settlements are unlocked by completing Minuteman faction quests. After earning the settlement, it's always a good idea to establish a supply line. You can send settlers to any settlement in your network, or you can send them all to one central point. Personally, I often use Sanctuary Hills as a hub to connect all supply lines, but any settlement (including the more centralized Castle) will work. That's just a primer on supply lines, now let's get into the details. To create Supply Lines, you'll need to unlock the Local Leader tier 1 perk. Local Leader requires CHA Level 6 to unlock. While in workshop mode on your settlement, you'll notice a new command at the bottom of the menu -- Supply Line. Move your cursor over a Settler and press the button prompt to assign them to a supply line. A menu will appear asking where you would like to send the settler. Assigning a settler to a supply line changes the NPC into a Provisioner. There are some important things you'll need to know about Provisioners. A Provisioner is a settler assigned to a supply line job. Like any other job in your settlement, the NPC will automatically begin completing their task. Provisioners do not stay in the settlement, instead they travel to their assigned location. The settlement from which they were assigned will remain their home settlement. They can only travel from their origin point to another settlement. 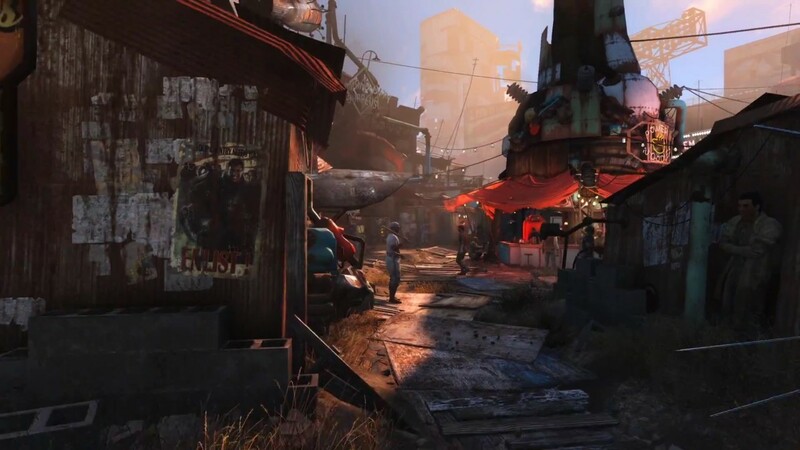 Provisioners travel the wasteland with a pack brahmin similar to travelling vendors. While travelling, they will not come under attack while you're away. If you happen to be near a provisioner under attack, it's probably a good idea to help, but I've never seen one die in combat. Although provisioners travel their assigned route, the supply line will instantaneously connect. There's no need to wait, after a supply line is established you'll be able to start crafting in workshop mode. A single settlement shares all inventory and resources between crafting stations -- the workshop, food crafting station, chem crafting station, weapon crafting station, and every other type of crafting station use the same pool of resources. So what does that mean? Connecting two or more supply lines into a network adds your resources to the whole. Namely, you'll be able to use the same pool of resources while crafting in all settlements connected to the supply line network. This makes it much easier to build defensive turrets at far-off or new settlements. Once established, travel to a settlement in your supply line network and assign a settler to establish a supply line to your new settlement. Now you can travel to the new settlement and begin crafting. Only random 'Settler' NPCs can be assigned to supply lines. Named NPCs must remain at their home settlement. That means you'll need two do two things to create supply lines. 1. Send extra 'Settler' type NPCs from unconnected settlements to connected settlements, then assign them to supply lines. 2. Build a Recruitment Radio Tower, hook it up to power, and wait for new settlers to arrive. Supply lines are incredibly useful. Any resources collected by settlers, junk items, or extra water and food will also appear in your combined resource pool. This makes crafting much easier. Any parts or resources, including modifications, can be applied from any weapon or armor crafting stations in the combined supply line network. To see your full supply line network, open the PipBoy map tab and you'll find an option to view supply lines. This shows a straight line between all settlements in your supply line network. While incredibly useful, supply lines don't do everything. There are many limitations and unknown information when working with supply lines. Fallout 4 does not explain or provide clear information when it comes to surplus food or water. How much you will gain or how it is shared between settlement inventories is currently unknown. Placing food or water in a supply line might not improve food or water happiness in settlements in the same network. Build crops and water resources at each settlement to make sure they are happy. Weapons, armor, or ammo -- any items you might want to actually remove from a workshop inventory -- are not shared on the supply line network. You'll have to travel to the original settlement station where you stored the items to retrieve them.